For fifty consecutive years (1964-2014), Hyperco coil springs were standard equipment on every car that won the Indianapolis 500. That’s quite a record. 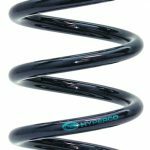 Hyperco got its start when an engineer named Jim Fielder started making springs for racing in the early 1960s. His designs quickly dominated motorsport suspension technology, in the USA and Hyperco has further refined them to keep you competitive today. Summit Racing stocks Hyperco coil and leaf springs for racing and road use. Optimum Body Diameter(OBD) coil-overs are made from ultra-high tensile steel. They adjust the body diameter of the spring relative to the end coils under load for additional deflection and more resistance to bowing. That means an OBD spring has a more consistent spring rate and offers predictable performance race after race. Ultra High Travel(UHT) coil-overs are designed specifically for light rate/high travel applications. The UHT design meets the requirements of soft spring and big sway bar setups, and has a larger ‘body bulge’ than the OBD spring design. That allows for additional deflection, rate linearity, and resistance to bowing. SEE HYPERCO COIL AND LEAF SPRINGS AT SUMMIT RACING ENDS. Print article This entry was posted by admin on January 31, 2019 at 9:00 pm, and is filed under News. Follow any responses to this post through RSS 2.0. Both comments and pings are currently closed.